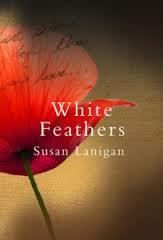 BleachHouseLibrary.ie: #IrishFictionFortnight - Day 12 - "White Feathers" by Susan Lanigan. Author Feature and Giveaway. #IrishFictionFortnight - Day 12 - "White Feathers" by Susan Lanigan. Author Feature and Giveaway. Thanks to the author, there is a PB edition of this title to giveaway as part of #IrishFictionFortnight. Just enter via rafflecopter link below. Good Luck! But when war does break out, her fanatical and disapproving stepsister Grace forces a choice on Eva. She must present Shandlin, who refuses to fight, with a white feather of cowardice, or no money will be given for her sister Imelda’s life-saving treatment in Switzerland. Caught in a dilemma, she chooses her sister over her lover, a decision which will have irrevocable consequences for both her and Christopher and haunt her for the rest of her life. Susan Lanigan was born in the Irish midlands and now lives by the sea near Dublin. Thrice shortlisted for the Hennessy Irish Writing Award, she has had short fiction published both nationally and worldwide. White Feathers is her first novel. Caution: this list contains men. Please direct all complaints to the management. When I talk about my influences, I do so as a working novelist. These are the people whose prose style I, um, borrow. Many Irish writers have inspired me: here I explain how. My novel White Feathers is set before and during World War One. Its protagonist, Eva, is second-generation Irish and I’m very aware that when it comes to Irish writers and WWI, I have illustrious predecessors. Sebastian Barry and Jennifer Johnston lead the way. I loved how the hapless protagonist of Barry’s A Long, Long Way, Willie Dunne, is not at the centre of everything, all the time. He is a tool of fate while retaining his own quiet decency in the face of unspeakable horror. Having read a lot of WWI fiction where the male protagonist inserts himself into Every. Single. Battle. (Sebastian Faulks cough cough...), that was refreshing. Jennifer Johnston’s How Many Miles to Babylon is a restrained and sad story about a friendship across religious divides which continues through the exigencies of war. Wonderful detail included about the chilblains! Irish writers are well placed to cover WWI because the colonial background means they’re aware that It’s All a Bit Complicated. Indeed there is still quite a bit of baggage in Ireland about that whole Great War thing, with a lot of forgetting it ever happened before we felt safe remembering it again. (Kevin Myers deserves a lot of credit for that change.) With Sebastian Barry’s novel, I really liked that the Chinese and Algerians were included in the narrative. It was a World war, after all. From the women’s fiction side of the house, I’m indebted to Maeve Binchy for the many deft tricks she employed to make her narrative gripping. I’m surprised at how underestimated a writer she is. Her dialogue captures the very complicated interstices of bourgeois middle-Fifties Catholic snobbery: “Imagine, and him coming from nothing”, “Imagine saying something like that that – and a young girl like you.” I rarely see it done so artfully – the closest living equivalent would be Niamh Boyce. Another Binchy trick I love is where she zooms out from an emotional scene and uses a total stranger’s point of view. The stranger poignantly gets the wrong end of the stick. At the end of one particular scene in White Feathers, the woman running the tea shop sees our protagonists embrace and mistakenly concludes that they are saying goodbye because the man has got his orders, when the true story is very different. I owe Binchy that scene ending. I also enjoy the exuberance of the early Marian Keyes novels. Humour done well is rare in any genre. One standout example from Lucy Sullivan Is Getting Married has Lucy enduring a truly horrific “personal ad” date with Chuck Mullerbraun III. “I wouldn’t say he broke wind, more like he shattered it into a million tiny pieces”. In my case, I was writing about some pretty intense, hard stuff so it was good to be able to lace it with humour whenever I got the opportunity. I salute Marian Keyes for making me laugh. Dermot Bolger has provided a consistent flow of novels, many a commentary on Irish life at a particular stage. I loved The Family on Paradise Pier, but the one that really affected my own writing was The Valparaiso Voyage. This, the story of a man who has chosen to disappear from his life after a train crash, brings to life, in the shape of the narrator’s stepmother Phyllis, the most frightening villain I have ever come across in fiction. Having married his father and moved her own son into their home, she banishes Brendan to the shed and forces him to live and sleep there in the cold, excluding him from the family and earning him the taunting name “Hen Boy”. For me she is so monstrous that she represents the iconic Our Lady of Emotional Violence, and provided a major inspiration for the character of Catherine Downey in White Feathers. As a character she is all too believable, and the effects of her emotional abuse have a lasting effect on Brendan’s soul. What makes a novel Irish, in my opinion, is that undercurrent of intuited rules to keep people in their place. When those unwritten rules are broken, retribution is savage. Although White Feathers is not set in Ireland, its backdrop is all too similar and familiar. That above all else is what I have learned from my forebears. One of my favourite reads of 2014, you can read my review here. White Feathers is published by Brandon/O'Brien Press and is available in paperback and ebook format. You can order a copy, with Free Worldwide Postage and 13% discount, here. Thank you for having me :) I might have been a little hard on poor old Sebastian Faulks, he does do good battle scenes! Fab giveaway M, thank you to Susan & you. Another author is one of my fav Sheila O'Flanagan. Caroline Finnerty and Martine Madden for O'Brien. This is one of my all time favourite books by the way :).